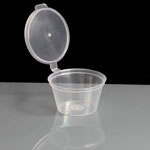 A microwave safe 2 compartment plastic container with lid made from clear polypropylene. 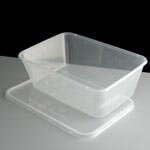 Rectangular in shape (17.5 x 120 x 74mm) with an approximate 460cc/ml capacity in each compartment, ideal for take aways. 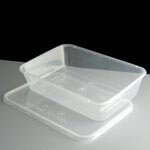 Great for a portion of rice and curry, chow mein, salads etc. 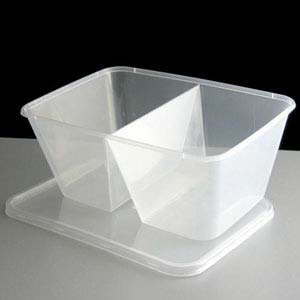 Perfect for storing/freezing those left overs for a rainy day. These containers will happily be frozen, but may go a little brittle if frozen and defrosted too many times. 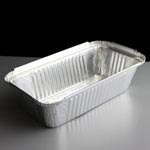 3 of these containers will fit in our Medium Handled Brown / White Paper Bags - perfect for take aways! Boxes of 250 containers and lids. 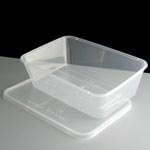 Feedback for 2 Compartment 1000cc Clear Rectangular Plastic Container and Lid - Required: Pack of 50 has been compiled from 0 reviews.